I don’t know if it’s just me, but October seems like the month of comfort food. I thinks it’s probably because of the change in temperature. The chilliness makes want to have warm minestrone soup along with garlic bread and pasta– one of my favourite meals growing up. So, because there was no school day (it’s Thanksgiving holiday), I decided to prepare one of my all time favourite pasta dishes… MAC N CHEESE. The amount of buttery and cheesy goodness in this dish just warms up my stomach and places a huge smile on my face. Unfortunately, I recently found out that my body doesn’t respond well to dairy, which would explain the breakouts I get after eating froyo, desserts, and pizza. So, I’ve decided to try and find a way to prepare my mac n cheese sans cheese. How you may ask? With DAIYA CHEESE! I first learned about this alternative cheese product that’s vegan, gluten and soy free from a cooking class I took with Marni Wasserman. What I like most about Daiya is that it melts like cheese! Unlike other non-dairy cheese alternatives, Daiya’s rich and creamy flavour of cheese certainly delivers the bold flavour and the gooeyness flavor of cheese without compromise! 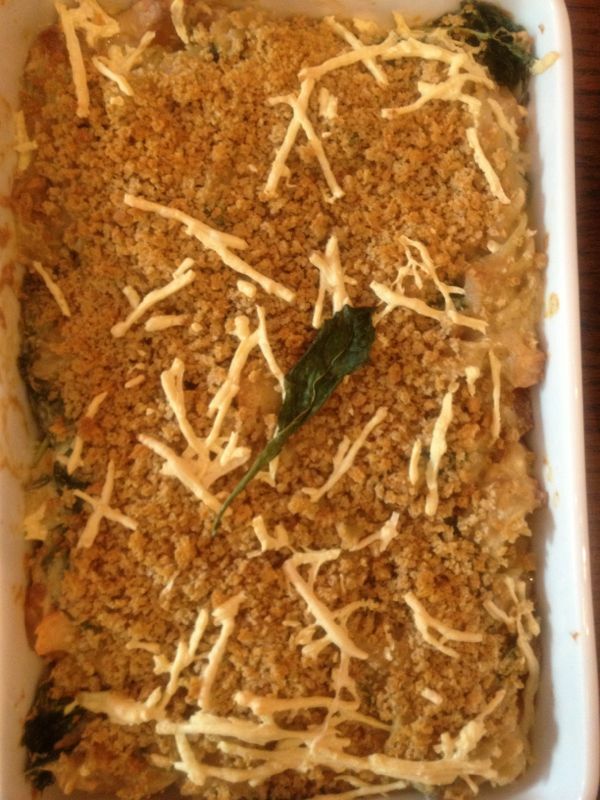 – Transfer your pasta into a baking dish and top with extra Daiya cheese and spelt bread crumbs. 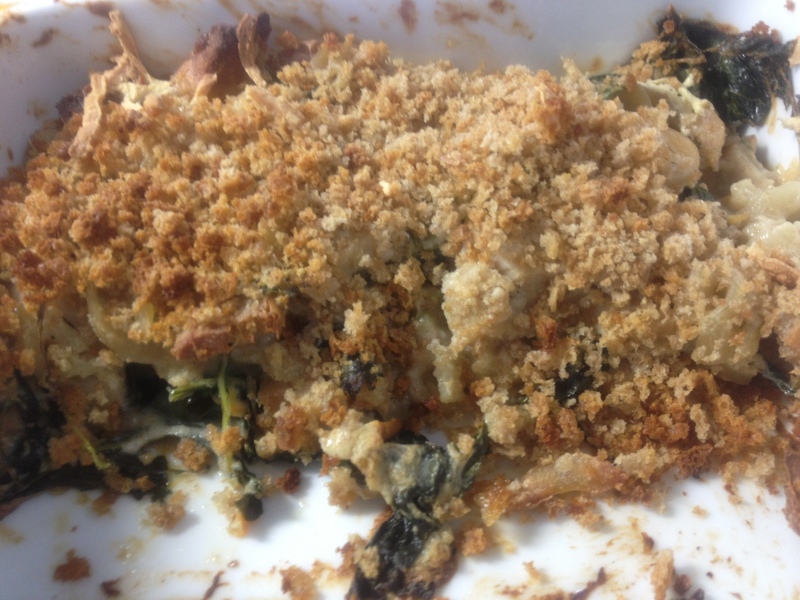 – Place the dish into the oven for 20-23 minutes, or until the crumb turn light brown and the cheese on top melts. ** Sorry for such bad quality photos! Turns out that I forgot to charge my camera! You’ll just have to trust me when I tell you that this dish was uber-tasty and creamy. Even my parents, who are not huge fans of sauce-based pasta dishes, loved it! Lastly, my question to you is: What’s your favourite comfort food recipe to make? Yes, that’s right– today’s post will be about PANCAKES! This past weekend was extremely busy and stressful as I had many assignments and tests to prepare for. So, having completed one of my assessments today, I wanted to treat myself with pancakes. That is, Banana Bread Oat Pancakes! It’s been a long time since i’ve indulged in this delicious recipe, so I am eager to share it with you! Despite the fact that the recipe is gluten free and vegan, by no means does it lack in flavour. 4. Head some oil in a pan, and once it is hot enough, pour the batter into the pan. When you see bubbles form on the surface of the batter and the edges of your pancake turns brown, flip and cook until the bottom has browned. Why Can’t There be Waffles Every Morning?